I am going to be torn apart for saying this, but I think Mega Bloks "system" is better than Lego "system." Not just because figures, but also the improved quality leads to some awesome metallic and camo bricks. Also, I swear I looked to see if there was already a topic about Lego compared to everything else. I apologize if I missed something. LEGO will always be my personal favorite Building Toy. Just the sheer variety of bricks allows you to create anything that you want to build, unlike the rather limited competitors. When it comes to their Minifigures, I also think LEGO wins. They're just the perfect blank canvas, allowing you to make distinct characters from pre-existing pieces, something I feel other brands lack. I think Mega Bloks "system" is better than Lego "system." But, Lego has far higher precision in their pieces and better quality plastic. Whenever I have received any Mega Bloks, there. Are always. Bricks. That refuse. To stick. Together! True, some of the Mega Bloks realms may be greater... But can MB do BIONICLE? But can MB do BIONICLE? MB and Lego are both great. it just depends if you prefer the shiny,clean look of Lego or the more realistic look MBs have. is the best thing ever. I just prefer it over the hyper realistic style of Mega Bloks' and McFarlane. Apparently, Mega bloks building system is worse because apparently the parts don't fit well, they over-mold parts, and don't allow for custom building. The figures are pretty cool though. But only the Halo ones. but I think Mega Bloks "system" is better than Lego "system." Someone is about to have a bad time. Anyway I do prefer Mega Bloks Halo over Lego Star wars. But Mega Bloks will never have Bionicle. MB and Lego are both great.it just depends if you prefer the shiny,clean look of Lego or the more realistic look MBs have. Well I prefer MBs realistic look over Lego's Shiny and clean look. Megablocks: I once bought a Mega Blocks Spider-man set-and it was garbage. It fell apart very easily, and the plastic feels worse than Lego. Oh yeah, and the mini-figure looked hecka weird. And I know they've gotten better, but I haven't bought any new sets, mainly because I don't like COD, I know nothing abot Halo, and assassins Creed does not intrisist me. Although I'm interested in getting some of the Ninja Turtles sets though. Kre-o: Yeah, I understand why Kre-o is hated. Its plastic is weaker. It's designs are horrible. They don't stay together that well. I, however, actually liked it. I thought they were good for what they were, and I just loved those minifigures. I don't know about any other brands (aside from knockoffs, of course) but I'm sure they're not that bad. I personally am a lego purist, but my friend has kre-o so i have experience it a bit. those minifigs are great in poseability, but the sets (the transformers ones are the only one i know of) are horrible. the heads are specialized pieces and disproportionate, and you have to rebuild them every time you transform them, and even then you don't use all the pieces. the problem here is that everyone is biased towards lego, so Lego will obviously be winning. Which was pretty trash. Yeah, it's beating a dead horse, but I bought a Neo Shifter which had way too much friction, was hard to build, and just didn't look good. The function didn't work. Unlike these competitors, LEGO is perfect. Aside from the crackable socket prices back in 2001-2010, the petrifying rubber bands from 01, the friction problems in certain 01-03 joints, and Ketar. LEGO has absolutely not had problems that they had to fix. Never. LEGO, I feel it gives more options the the MOCers. If anything, they continue to improve the quality even if there's nothing wrong with it! That's why I singled out system. Bionicle and other nostalgia is honestly the only reason I like Lego anymore. The prices are ridiculous and minifgures aren't that great. Sure, they're cool, but they're not like mb's tiny action figures. The vehicles also usually look more realistic while still being rebuildable. The prices are ridiculous and minifgures aren't that great. Are you kidding? System is in its Prime. First off, the prices. I could sit around all day and talk about TLG's "Ridiculous Prices", but this article from Reality Prose covers it rather well. Now we have the minifigures. Look, I understand that some fans want realistic figures in their sets and want LEGO to change up their figs, but they just can't. They would be destroying a nearly forty year old pop culture iconic. That's like Disney scrapping Mickey Mouse. If you really want the more realistic and, in my opinion, less customizable minifigures, I would go to TLG's competitors. I'm not a big fan of the realism argument when it comes to why Mega Bloks are better. LEGO has shown that they can make great looking, realistic-looking models. The Mini Cooper and Volkswagen Camper Van re probably the best examples, closely resembling the original vehicles. Besides, LEGO subjectively has better builds. And the 220 piece LEGO set, Marvel Superheroes Avengers Hydra Showdown. 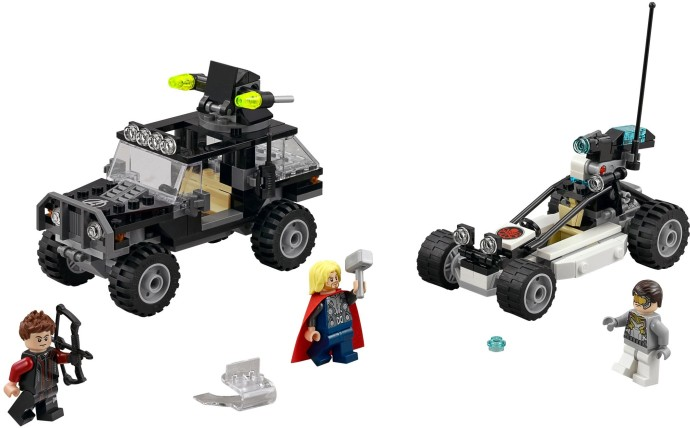 These two sets are of similar size and includes at least one four-wheel vehicle from a licensed theme. In the end, it all comes down to your personal preference. Do you want realistic, yet limited products from Mega Bloks or do you want the "cartoony" but complex sets of LEGO? 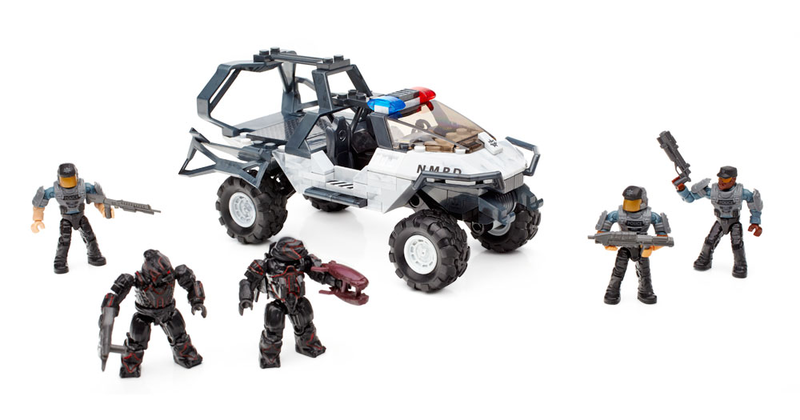 I liked both Lego and Mega Bloks, but tbh only good thing Megabloks has is the Halo line with a few things there and there. And while some mega bloks sets look realistic they usually lack some complexity and playability. So imo Lego is better if you want cartoony things with tons of play features, while Megabloks is better if you want a bit more realistic looking display.